Quite an impressive group for the foundation of our republic. 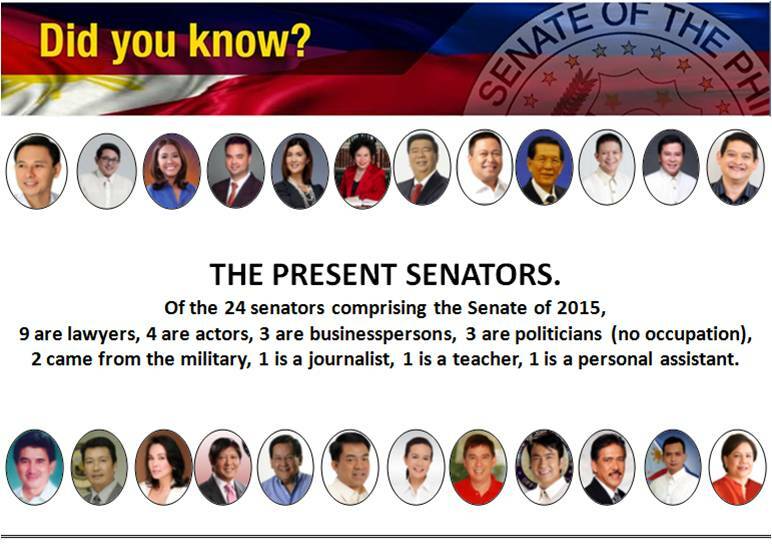 What strikes one is the number of show business personalities in the Senate and three “politicians”, in other words, they went straight to politics with no known occupation. A curiosity is one senator who was a personal assistant/liaison for her mother. Two questions: how did they get elected? And are they or will they be effective legislators? Let’s start with show business personalities. It started with Rogelio dela Rosa, matinee idol in the 1960s who became our vice-president. [De la Rosa had an illustrious public servant career as vice president and ambassador.] Filipinos are big movie star fans and will vote based on popularity and not on merits of a candidate. We are still a long way off from an educated electorate. It’s just too bad and it may take several generations for the Filipino people to get out of this mindset. 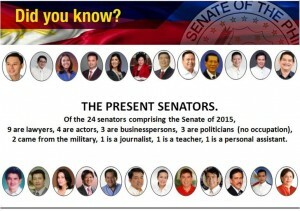 In the meantime, we can only hope that these show business personalities turn out to be good legislators (a crapshoot at best since the track record of actors/actresses have not been good – shall I mention pork barrel or an ousted president?). The election of senators who have not had enough experience in making a living on their own or as an employee or, as the saying goes, “having paid their dues,” is due to three things: name familiarity (political dynasty), power (political dynasty), and money (political dynasty). There is a strong push to outlaw – or limit by legislation – political dynasties. This will be a futile exercise – good luck in passing this bill, to be approved by legislators belonging to political dynasties. And also, the anti-political dynasty bill could be a double-edged sword; it may eliminate very qualified candidates, belonging to a political clan, from holding office. It will ultimately boil down to having an educated electorate, choosing the right candidate whether he or she belongs to a family of office holders. 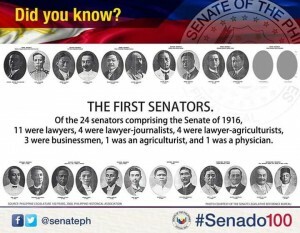 As I was about to conclude this article, I just realized that our early exercise in governing our country with the election of our first senators was a practice of democracy in its purest form. Our forebears were excited; they wanted a better future; they wanted good and honorable men to run our country. They voted for the most qualified candidates. We are at a crossroads in our practice of democracy. Perhaps we had to elect dim-witted, corrupt, or unqualified candidates to show us all that we all lose when we select our senators based on popularity and political dynasties. Maybe we are more than halfway on our road to an educated electorate and that we have learned our lessons that the action hero of yesterday or the son and daughter of a vice president or former president, with nary an experience, can be a legislator. 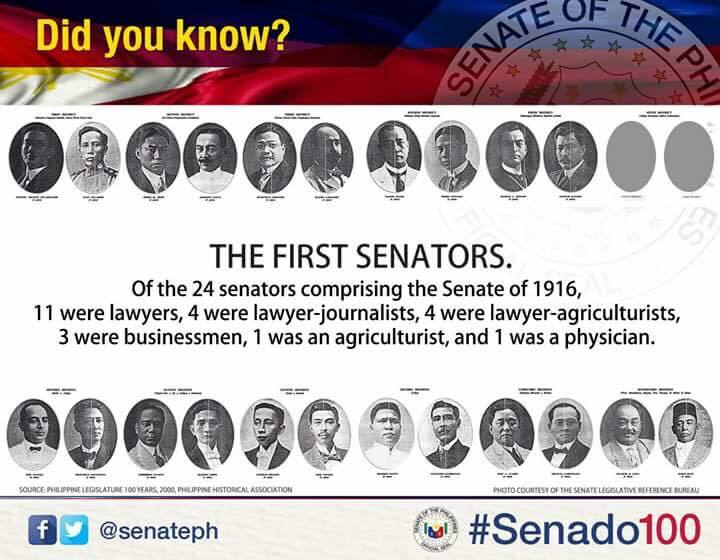 I salute our first senators and am proud to be one of the inheritors of their good work.